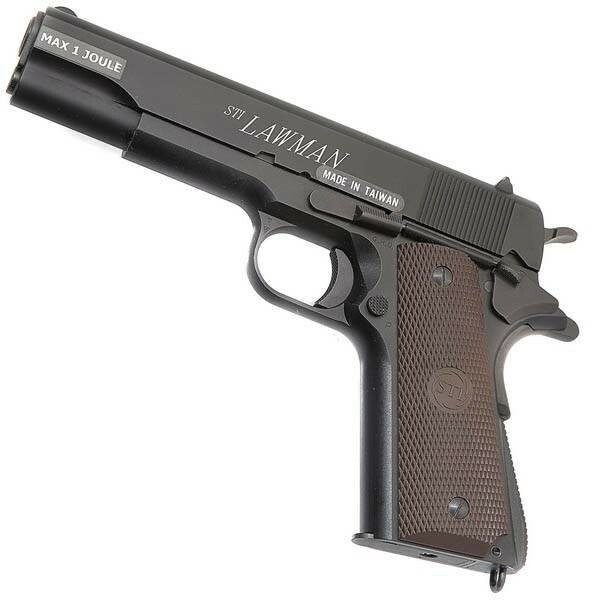 The classic Colt 1911, under the name of STI Lawman, is a replica with CO2 functioning. Other important information: metallic slide, metallic stock, ABS plastic grips, on the bottom the stock is fitted with a ring for attaching the safety strap. Package contains: STI Lawman gun, hex wrench for mounting the CO2 vial and a box of about 100 BB's (0,20g). We recommend using BB's of 0,20g and 0,23g. WARNING: the CO2 container will NOT be let in the magazine/stock for more than 12 hours, because the pressure put on the o-rings is very big, excessive wear leading to their deterioration. Recommendation: before inserting the CO2 container in the loader/stock, spray the intake valve (where the container is drilled) with silicone oil. If you no longer want to use your airsoft gun that day, but the CO2 container is not completely empty, gradually loosen the screw that presses the container until all the remaining quantity of CO2 is liberated. The weapon / magazine is stored empty, without the CO2 container or BB's.